The What: BTX Technologies has released the version 2.7 release of the BookIT room scheduling solution. The What Else: BookIT 2.7 includes many new enhancements, but the most significant features are the addition of digital signage capabilities—BookIT panels can now be used to display digital signage and company information via HTML5 when meetings are not scheduled—and enhancements to panel usage—a new meeting duration picker and a default Meet Now meeting title work together to further simplify the process of adding meetings directly from the BookIT touchpanel. “We’re proud of this release as it directly addresses the feedback we’ve gotten from our customers,” said Greg Schwartz, CEO of BookIT and BTX Technologies. “Organizations want to use our BookIT panels for digital signage and messaging when meetings are not scheduled and now, they can. Our customers also want complete simplicity when setting up impromptu ‘Meet Now’ meetings from a BookIT display. Version 2.7 reduces that process to three simple touches. While this release is substantial, look for another release this year that continues to expand BookIT’s capabilities. Customers with current software maintenance can upgrade to Version 2.7 for free. The complete list of new features and fixes for 2.7 are listed below. Digital Signage: BookIT panels can now be used for digital signage via HTML5. 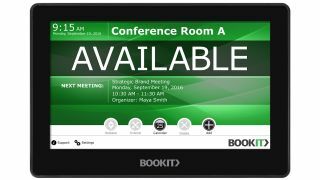 Display useful information such as corporate messaging on BookIT panels when meeting rooms are not in use. Default Meet Now Title: Set a default title to be used when adding a meeting with the Meet Now button. Meeting Duration Picker: When adding meetings, users can now simply select a meeting duration. Allow Anyone to Release or Extend Meetings: With new settings, an organization can allow anyone to release a meeting room or extend a meeting from the BookIT display, not just the meeting owner. Optimized Calendar Lookahead: Calendar items will now load even faster, which makes booking future meetings directly from the panel easier. The Bottom Line: BookIT, a division of BTX Technologies, is a room scheduling solution that helps organizations optimize their ROI on shared meeting spaces. It allows users to choose rooms and schedule or change meetings from their BookIT panels, computers, or mobile devices and integrates natively with MS Exchange, Office 365, and G Suite, requiring no additional server nor middleware.